Motorola Xoom is the first tablet to rival the iPad, and no wonder with all of the great features packed into this device. But learning how to use everything can be tricky&#8212;and Xoom doesn't come with a printed guide. That's where this Missing Manual comes in. 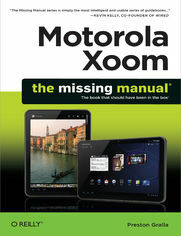 Gadget expert Preston Gralla helps you master your Xoom with step-by-step instructions and clear explanations. As with all Missing Manuals, this book offers refreshing, jargon-free prose and informative illustrations.